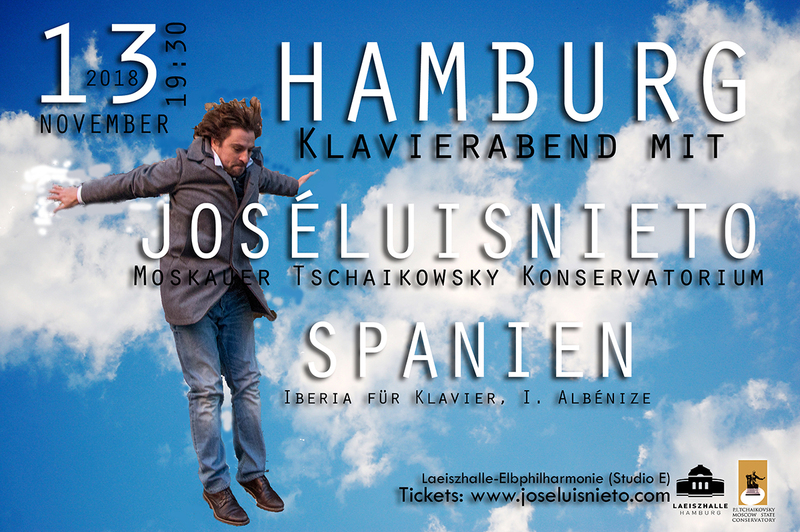 Within the framework of activities developed by the Cultural Work of FUNIBER on November 13, at 7.30 pm, the Spanish pianist José Luis Nieto starts his tour in Central Europe with a concert in the Laeiszhalle – Elbphilharmonie in Hamburg (Elbphilharmonie) playing the Suite Iberia from Isaac Albéniz. In this well-known concert hall in Hamburg (Germany), the great pianist from Cádiz will play the Suite Iberia from Isaac Albéniz. This will be the first concert offered by the artist in his new Europe tour. Suite Iberia was composed between 1905 and 1909 and it is one of the main works of the Spanish pianistic literature. The technical and interpretative aspects of this work are a particular challenge for any interpreter. Just a few pianists have set as their personal challenge to play the whole compilation in a single concert, as well as to record the work in its totality. Suite Iberia has four booklets of 3 pieces each. The pianist José Luis Nieto will play 6 pieces in the first part of the concert, and the other 6 pieces in the second part. During October, José Luis Nieto did his Central American tour sponsored by the Cultural Work of the Iberoamerican University Foundation (FUNIBER), for which extraordinary concerts have been performed in Guatemala, Honduras, Costa Rica, El Salvador and Panama. José Luis Nieto, considered one of the main models as international concert pianist, has published seven albums with success among specialized critics and has a wide agenda of concert throughout Europe. In Hamburg, the pianist will record his live concert and thus, will publish his eighth album.